And when it comes time to customize your treasured luxury vessel, no matter which model you have purchased, you will receive 25% off ALL Yacht modifications. When your time as a VIP is too precious and you need to get where you are going by way of the friendly skies, purchase the extravagant SuperVolito and SuperVolito Carbon at half price this weekend, compliments of Elitas Travel. Travel as a pack with your squad by way of the Turreted Limo from Benefactor - also now available at 50% off. Whether taking on a rival Organization in an Executive Deathmatch or a Hostile Takeover, this armed and armored ride available from Warstock Cache and Carry will do the trick. SecuroServ is offering a small business incentive-like program this weekend for all you up-and-coming entrepreneurs. In addition to no VIP threshold, you will be getting VIP Services at half cost - from Ammo and Armor drops to vehicle ordering and more. Perfect for any start-up VIP. 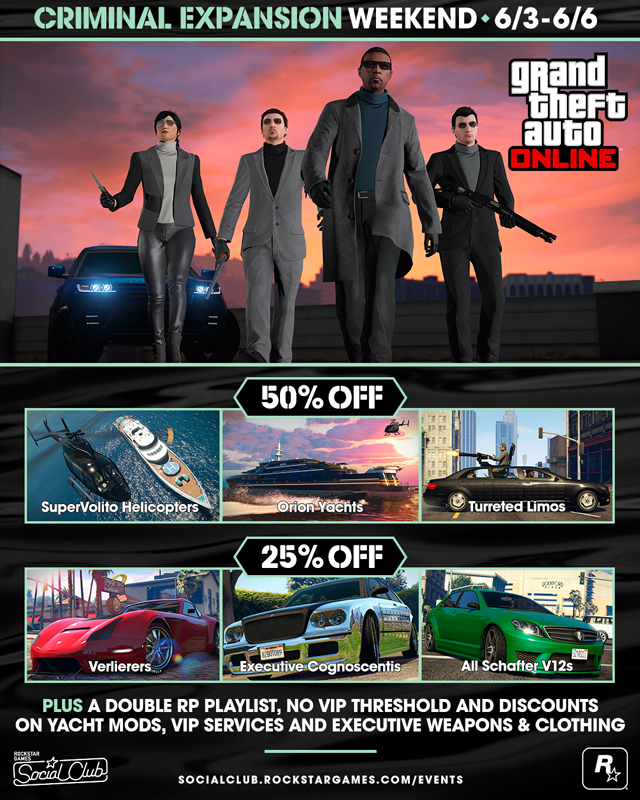 Take advantage of a flat 25% discount on several vehicles from Executives and Other Criminals, available all weekend via Legendary Motorsport. You will find price drops on the sleek and sporty Verlierer, all four variants of the Benefactor Schafter (including LWB, Armored LWB, V12 and Armored V12) as well as four models of the luxurious Cognoscenti (the standard, Armored, 55 and 55 Armored). Ammu-Nation is also giving incentives to upper crust criminals with half off the Heavy Revolver and Switchblade. Hit up any location for discounts on these particularly effective weapons. All weekend long, accumulate Double RP in an Adversary Modes Playlist. Upon cue at the GTAV launch screens, go directly into this special Playlist which features Extraction III, Inch By Inch IV and In and Out II. GTA Online Criminal Expansion Weekend - VIP mode will be expanding soon so get your hands on content from the original expansion with discounts and bonuses in GTA Online this weekend.